Looking for those last minute special gifts for that special someone? Maybe it’s best not to take a tip from Robert. He spent many hours browsing through the myriad of shops and strolling down their virtual aisles. 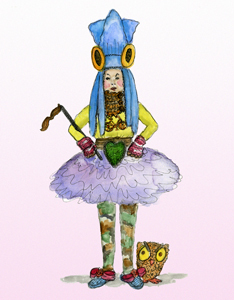 He just knew she would love the giant fleece squid hat, the living moss heart-shaped belt buckle, the spectacular tulle tutu, a hand-knitted cowl and a quizzical needle felted owl. He wasn’t really sure about the camouflage tights, although he thought they were quite alluring.